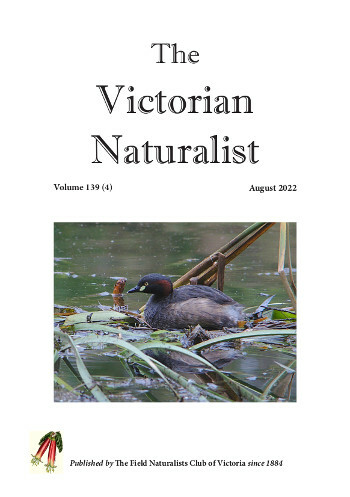 The Victorian Naturalist is the journal of the FNCV and has been published continuously since 1884. It is currently issued six times a year, and is received as part of the membership subscription of the FNCV. The journal publishes a mixture of scientific Research Reports, Contributions, Naturalist Notes and Book Reviews, intended to appeal to a wide readership. Articles judged to be Research Reports or Contributions are refereed by external authorities. The journal’s editors accept articles of relevance to Australia on the widest range of natural history subjects. Articles with an historical focus on significant people or events within the areas of interest are also considered for publication. A digital copy of volumes 1–70 of The Victorian Naturalist is available for purchase on a DVD. This can be obtained at the FNCV office or through the FNCV book sales officer, Kathy Himbeck (contact her on bookshop@fncv.org.au). The DVD is totally searchable and is available for $49.95 to FNCV non-members. The FNCV acknowledges the assistance of The Norman Wettenhall Foundation, which provided a grant to create this digital archive. Work is currently progressing toward uploading to the Web all digital copies of the Club’s journal.